Charles Danielson later acquired the building and business as his own. In 1912 the store was destroyed by fire, but was immediately rebuilt, with a second story added to the west half of the building. This second story was occupied with offices in the front and furniture storage in the back. An elevator was installed so that furniture could be lifted to the second floor. One of the offices was occupied for many years by T.R. Johnson attorney, and another by Dr. C.W. Bjorgo, physician. In later years Ignora Reddicliffe operated a beauty parlor in one of the suites and Dr. R.M. Bahnson, osteopath, had his office and living quarters there. When Ignora and Dr. Bahnson vacated, the rooms were rented for living quarter, occupied by Mabel Westerson, Mrs. Minnie Johnson, John Banks, and Mrs. Amanda Swanson. More recently the rooms have been used for furniture display and storage. P.N. Allen worked for Charles Danielson as an undertaker and embalmer. And John Wolander used to work in the basement repairing furniture and making coffins. About 1916, Charles Danielson sold the furniture and undertaking business to George Valentine, but retained ownership of the building. P.N. Allen remained and worked for Mr. Valentine. About a year later, Carl V. Swanson of Cannon Falls was employed by Mr. Valentine as embalmer and funeral director. This was during World War I, and it was not long before Carl Swanson was called upon to serve his country and left for the army. At this time, Mr. Valentine hired Don Dibble, also an embalmer and funeral director, to work for him. When Mr. Swanson returned from the army, he had no employment. As Mr. Valentine would not discharge Mr. Dibble to rehire Mr. Swanson, Mr. Swanson started a funeral business for himself in another building. However he soon bought the funeral business from Mr. Valentine and operated it with Mr. Valentine in the furniture store. Mr. Dibble at this time went to Kasson, Minnesota, and bought a furniture and funeral business. After a few years of operating the funeral business, Mr. Swanson also bought the furniture business from Mr. Valentine and operated it with the help of his brother Arthur. Carl Swanson died in August 1932. His wife, Eva, with the help of Arthur Swanson, continued the business for about a year then sold it to Harvey Edstrom. Mr. Edstrom employed Burt Kulander as embalmer and funeral director. After about a year, Mr. Edstrom and Mr. Kulander had a disagreement, and Mr. Kulander started business for himself. Mr. Edstrom hired James Ludford, who worked for him until Mr. Edstrom discontinued business in 1935. At this time the Danielson building became empty, and Arthur Swanson moved in to operate the furniture and funeral business. About 1937, Ben and Leola Gergen bought the building and on March 15, 1937, Clinton and Ruth Lundberg purchased the business from Arthur Swanson and the business became Lundberg's Furniture and Funeral Service. They immediately remodeled the back part of the east half of the building for a chapel, office, and reception room for the funeral business. At this time the only entrance to these rooms was through the furniture store because jewelry and tailor shops occupied the front part. In September 1960, when the Lundberg family purchased the building from the Gergens they immediately put a new front on the building, both on the furniture part and on the east part, the mortuary. In 1963, the jewelry store and tailor shop were vacated and the interior was completely remodeled into a modem funeral facility with a separate entrance. A service the Lundbergs offered the community when they began in business was that of ambulance service. This Mr. Lundberg did until March of 1968 when the city purchased the ambulance and took over that service. Because Clint Lundberg’s grandmother died in 1912, he remembers well the horse-drawn hearse and hack for the relatives to ride in. The year the first automobile hearse came into use in. Cannon Falls is uncertain. The first funeral Mr. Lundberg had after taking over the business was that of Mr. Charles Danielson, former owner of the building and business. At that time it was the custom to have a funeral first at the home and then in the church. The body would be taken to the home the day before the funeral or in the morning the day of the funeral, and friends and relative would call at the home instead of at the mortuary as they do now. When Mr. Danielson and Mr. Valentine owned the business it was not uncommon to do the embalming in the home. The record of all of the funerals conducted from this establishment reveals many interesting facts. For instance, the cause of death of many people at the beginning of the business was listed as "old age" or "consumption", and there was a very high rate of deaths among children from contagious diseases. Many changes in the furniture business also took place during the 36 years the Lundbergs were in business. As an example, more cotton mattresses and flat springs were sold in 1937 than innerspring mattresses and box springs, and today you can't buy a cotton mattress of flat spring, unless you find a used one. Cotton mattresses sold for as low as $4.95. About this time people were beginning to cover their floors with wall-to-wall linoleum - not just linoleum rugs. Mr. Lundberg sent Earl Stedman to the Armstrong Linoleum Laying School at Lancaster, Pennsylvania for instruction in this work, and he became very good at this trade. He later took short courses on installing countertops, wall tile, and floor tile. This part of the business grew so much that it kept one man, and many times two men, busy with this type of work. Later on wall-to-wall carpeting became a big part of the business, and still is. On July 1, 1973, Mr. and Mrs. Lundberg sold the business and the building to Mr. and Mrs. Stanley Mattix. Mr. Mattix had been employed by Mr. Lundberg for several years, and the business is being carried on under the Lundberg Furniture and Funeral Service name. Mr. and Mrs. Mattix operated the furniture store and funeral home from 1973 until 1980. The business and building were sold to the Vertin Company in 1980. 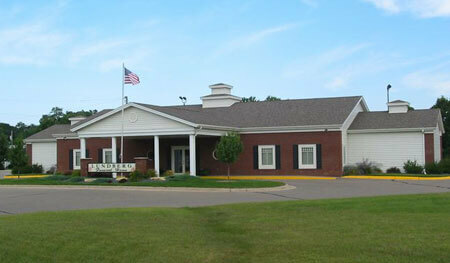 Vertin Company owns a number of funeral homes in Minnesota and surrounding states. Over the next few years several funeral directors managed the funeral home. Funeral assistants included Lil Pagel and Roland Peterson. Virginia Wambach managed the furniture store during this period. Since 1986, Sue Lodermeier has been managing funeral director of Lundberg Funeral Home. In 1989, land was purchased from Jerome and Meg Judge, to build a new funeral facility. The funeral home moved to its current location at the intersection of Highways 52 and 19, in 1990. Lundberg Furniture was sold in 1991, to Marlene Ulrich. The store was relocated to the Cannon Mall, with the store being managed by Carissa Ulrich. The Lundberg Furniture name was changed to Casual Living. This store sold home accessories until its closing in 1996. Today, in addition to Sue (Lodermeier), Klicka manages the funeral home and Jim Cylkowski, Dean Anderson, and Donna Anderson serve as funeral and visitation assistants. In 2004, Lundberg's elected to no longer sell furniture, carpet, linoleum or draperies. And the ambulance is no longer part of their services. As Cannon Falls has grown and changed so has the funeral business. Today, Lundberg's offers a variety of services that include traditional funerals, cremation services, monuments and markers and preplanning services. Looking back, on the past 150 years, many changes have taken place. Looking to the future, we cannot see the challenges that lie ahead, for our city or for our business. But as we proceed in the 21st century, our goal at Lundberg Funeral Home, is to continue to serve Cannon Falls and surrounding areas with compassion and dignity.